Before 4-H was racially integrated, Extension Youth Development programs for African American youth emanated from the 1890 universities, which celebrated their 125 anniversary last year. North Carolina started 4-H for African American youth in 1914; West Virginia started camps for black youth in the 1920s and had the country’s first state camp for African American 4-H’ers. In recognition of Presidents’ Day we acknowledge the US Presidents who served as honorary chairmen of 4-H, and quote many who “liked” the program over the years. The collection of these historic art pieces continues to grow! Antique mall hunters and internet shoppers have added three pieces to the collection already this year. There are many more to find and you can help. From a 1920 article about farm mechanics and a 1945 article on Live Power to today’s robotics programs, mechanical engineering has been an important part of 4-H. Some ideas to bring that history into your current club work. 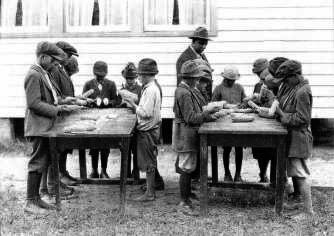 Virginia African American Corn Club members (early 4-H clubs) learn how to judge corn, 1923. 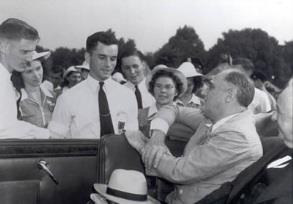 A 4-H TV series produced with NASA was premiered, Franklin Roosevelt expressed thanks to 4-H’ers for helping achieve wartime goals, the first club meeting of farm boys, later 4-H’ers, was held in Illinois, and a 4-H movie on health was premiered. Different years, of course, but an important month. Seventh in the series of “Folks who Helped Make 4-H Great.” Smith helped create the 4-H Subcommittee of the Extension Committee on Organization and Policy, helped implement the Smith-Lever act nationwide, and established the first National 4-H Camp on the Washington, DC, Mall. Besides Black History Month and Presidents’ Day, February also has Valentine’s Day. And who doesn’t love 4-H? Sit down with your box of Valentine chocolates and ponder the New Year’s Resolution you made last month: to read this Newsletter each month and forward it to at least one other person. And while you’re munching on the chocolates, enjoy this issue! Please help us preserve 4-H History . . .